M isn’t home tonight and I have to admit I like having the apartment to myself. I’ve never lived alone, so I sort of relish having full nights all by my lonesome. My big question is always: what am I going to eat and what am I going to watch? I debated ordering Chinese or eating a whole buffalo chicken pizza, but I decided to go to Dave’s Fresh Pasta and get a few things. I had some chicken and some basil left over from making this chicken pho from Smitten Kitchen during the already infamous Blizzard of 2015. 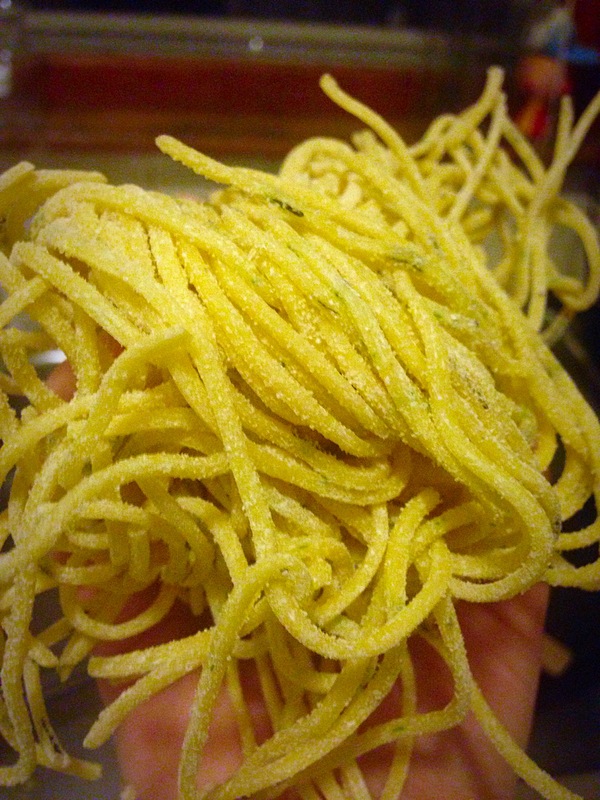 So, I decided to make some pesto, get some fresh pasta, and have myself a little party. While there, I told myself I could either get wine or cheese. I’ve been trying (with limited success) to save money lately, so I figured one would be enough of an indulgence. Really, it was no contest. Cheese it was. 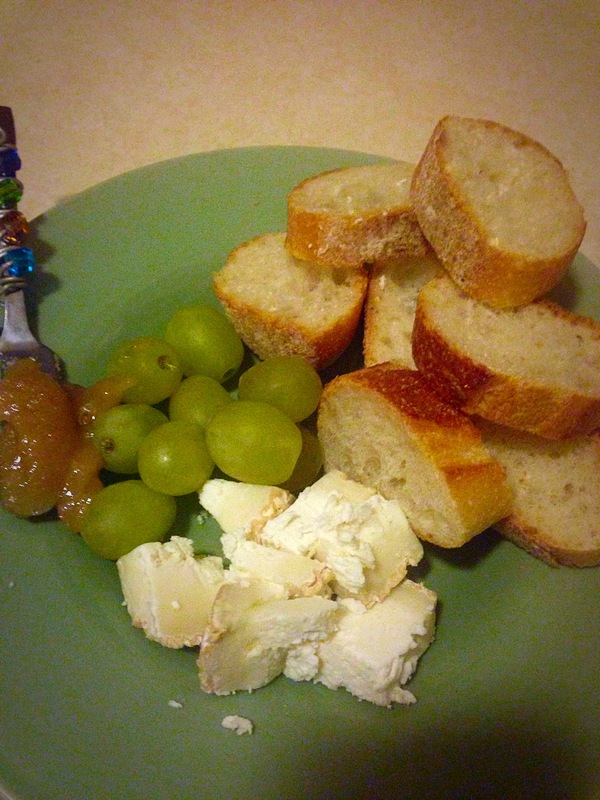 And because M is gone, it was gonna be GOAT CHEESE all the way, as he hates it (“too goaty,” he says) while I love it. I picked out a bucheron, which Murray’s Cheese tells me “was one of the first French goat cheeses exported to the U.S.” They also offer the following tempting description: “Let’s take a step back and enjoy the two texture magic that every sliced round has to offer; a fat, sometimes inch thick, creamline forms beneath the downy, edible white rind- a perfect visual of surface ripening in action. The large format means that the creeping goo will never reach the center, so there’s always fresh, fluffy, lemony chevre left for contrast.” Yeah, I made the right decision. 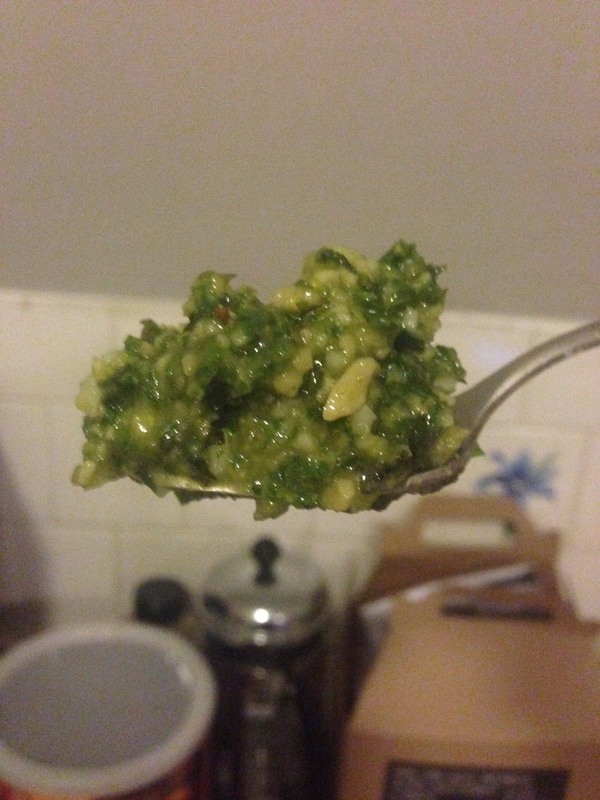 After my cheese plate, I made some pesto and served it with some Rosemary pasta and the leftover chicken. Oh, and I’m watching Father of the Bride: Part II. I have loved those movies since I was little, but I have to admit it is a bit dated (ahem, misogynistic, ahem, xenophobic) with 2015 eyes. I realized my bio mentions pasta and cheese…writing it must have put them on my mind!